The Harloff Medstor Max Triple Column Cystoscopy Medical Storage Cart is a preconfigured, high-capacity storage device designed with the most innovative modular tray system on the market today. It provides quick and easy access to medical supplies for surgeries on the urinary bladder and the urinary tract. Abundant Space. Made with 30% more storage capacity than any other cart in the market today, the Medstor Max Triple Column Cystoscopy Medical Storage Cart allows the facility to purchase fewer carts which save money without losing workplace efficiency. The cart's configuration includes a catheter slide shelf (with 3 robust dual slide assemblies that have 5 hooks per slide) as well as trays of various sizes. Customizability. 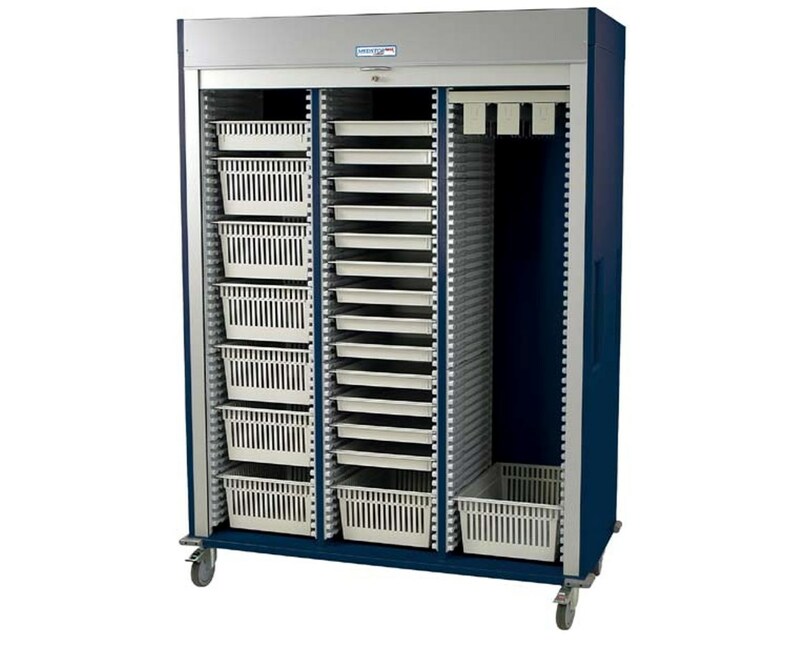 The cart includes clip-on locking adjustable dividers allow the tray to store higher loads and provides the user a way to optimally organize supplies on them. 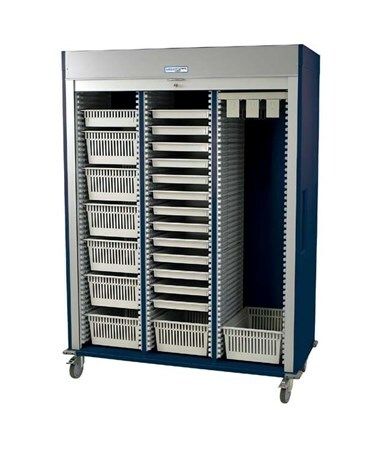 A column of the cart can be removed to increase catheter storage capacity or to install full-width shelves on either left or right of the cabinet. Its included plastic side panels provide 47 insertion opportunities per column (total of 141) which allows the user full customizability of the cart. Pull-out stoppers allow the modular trays to be extended and viewed at any angle. Hassle-free Mobility. Mounted on 5" premium full swivel casters with two that brakes, the Medstor Max Triple Column Cystoscopy Medical Storage Cart, with its integrated vertical push handles, can easily be transported around the facility. Corner bumpers are installed on the base to prevent the cart from damages during collisions.